How Silence Can Be The Foundation Of Creativity - Motivate Amaze Be GREAT: The Motivation and Inspiration for Self-Improvement you need! I never understood the importance of silence in my early years. A loud and hyperactive child, I struggled to dedicate time to peaceful activities. This continued later on in life until eventually, I realized that filling every moment with activity and sound wasn’t helping. I felt scatter-brained and I lacked the inner concentration needed to accomplish the important tasks in my life. That was the time when I first started researching silent self-reflection and the impact it had on productivity, creativity and being successful. The results of my research appeared a bit surprising at first but after taking some time to analyze the information, I found it to be nothing but logical. 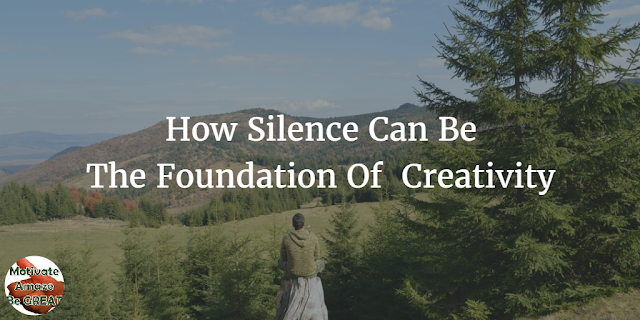 Silence has an amazing potential when it comes to sparking the fire of creativity. The first time I tried actively to remain silent, I felt really uncomfortable. I experienced a giant “vacuum” that lacked all of the noises surrounding me on a typical day. The silent session simply felt empty and threatening. While the level of discomfort was high, I was highly motivated to persevere. In a bit of time, the lack of words led to an amazing transformation. Without all of the surrounding distractions, I was capable of taking a deeper look inside myself. This deeper look helped for reconnecting with my true self – the person that I was, the person that I currently am and the person that I want to be. The outer silence led to an inner dialogue that reminded me of just how creative I can be when I focus. The fact that I was connecting with myself once again also increased my ability to free write – a wonderful exercise that has a profound connection with being original and learning how to express ideas in an authentic manner. In today’s world, we’re all vulnerable and susceptible to a contemporary phenomenon called FOMO – the fear of missing out. We often feel that if we don’t get new information, we don’t check our phones or social media all of the time, we’ll be left behind when something important takes place. Contemporary people believe that “outside noise” and the access to tons of information/communication channels will contribute to being smarter and more effective. The truth of the matter is that the exact opposite can happen. Periods of active silence and relaxation are needed to help the brain reboot. The brain can be viewed as a muscle. The more it gets “exercised,” the stronger it becomes. In the world of working out, however, exercise should be followed by a period of rest that enables the muscles to recover. Focusing solely on information output will eventually cause burnout and prevent the brain from functioning properly. The research of psychologist Jonathan Smallwood confirms the claim. Smallwood has found out that human creativity is heavily dependent on one’s ability to shut out external factors and focus on the so-called self-generated thoughts. In a sense, this claim is similar to the first one. Taking a deeper look at one’s inner-self is the key to being more creative. The two explanations have slightly different nature – one is purely emotional and the other focuses on brain processes. Both of them, however, reach the same conclusion. Switching off and enjoying a silent retreat every now and then is the best way to reboot and experience a surge in creativity. All of this sounds great and I’ve already given you the scientific explanation. My personal experience confirms the very same thing – a silent retreat helps. It’s no wonder that many famous artists and musicians have been known to go on silent retreats. A silent retreat can be difficult to do in the very beginning because of the discomfort already mentioned in the beginning of the article. Still, if you’re committed enough and you follow a few basic tips, you’ll make the most of it right from the start. Get rid of the distractions. If you’re going away from home, you may want to leave your phone behind. If you absolutely cannot let go of this communication tool, switch the phone off for at least few hours each day. Go in nature and spend time by yourself. 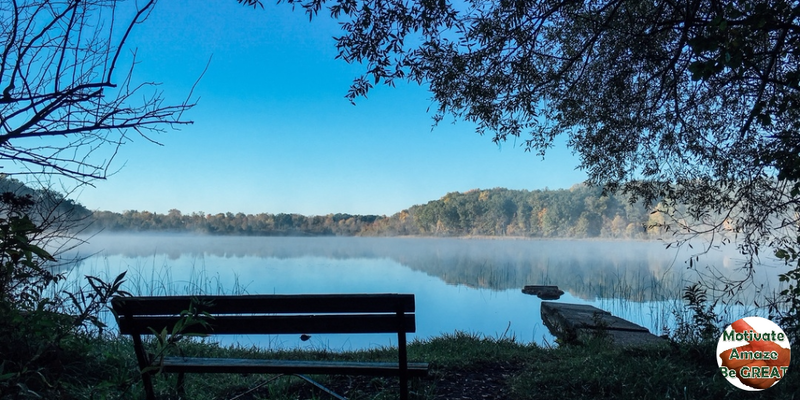 Watching a spring run or sitting in the grass, allowing the sun to caress your skin, can initiate that inner conversation in a way that urban settings aren’t going to predispose you. The most important aspect of having a silent retreat is to refrain from pushing too hard. Let your mind wander without expecting anything in return. You’re not going to experience a sudden rush of creativity and you should most definitely not focus on that. Again, when going on a retreat, whether it’s organized or you simply spend a weekend in the countryside, you should let your mind wander. Don’t have certain expectations – you can’t force your thoughts into a certain direction. Exploring freely what’s inside of you and what makes you tick will help you accomplish the results that you’re looking forward to. Dream without fear, go through the memories that you tried to leave behind and don’t worry about digging deep. While you may uncover some painful or troubling truths, you’ll feel very liberated at the end of the experience. You carry creativity inside yourself. Silence is the best way to bring it out. Eliminate the distractions, take some time off and have a conversation with the person that matters the most – YOURSELF. Like this article? Share it with your friends and family so they can too learn how to use silence as the foundation of creativity and spark new ideas to improve their lives. It's all about developing yourself and others, improving your skills and sharing what you've learned. Being a content marketer and writer at AU essay service review, Alice Clarke is fond of stargazing and travelling by car.